← The Medications We Take; the Scam! I spend a lot of time talking to migraine and fibromyalgia sufferers from all over the world, talking to them via email or Facebook or blog–some even phone. I consistently find–particularly in the Unites States–that anxiety related conditions are treated with antidepressants. This was very clear to me when I was a migraine sufferer and my migraine specialist wanted to place me on a serotonin preventive as she explained it is for depression but seems to work for many people with migraines. This sent me to research the subject and of course it ended up in a book with a solution for migraine, finding the cause–which by the way shows that migraines have nothing to do with depression. I am very happy that I turned away from the serotonin preventive and in fact turned away from all migraine medications since they were all some form of triptans, which are serotonin. As now my book on migraine is quite successful and many people are cured completely without any medications, I can stop and look why exactly are triptans offered for migraine when originally they are antidepressants. Is there a logical connection anywhere that I missed when I attended my doctoral classes on the brain? Have I missed the brain anatomy to such large degree that I cannot tell regions of anxiety and regions of depression apart? What exactly does the research community have available to make the statement that antidepressants will work on anxiety? And on those occasions when they actually do work–as sometimes they do–why do they work? And why don’t they work other times? In this article I compare brain anatomy by pictures available on the Internet–I will be citing all publications and provide links so you can follow and read. Let me start by a couple of pictures of depression so you can see where in the brain the light areas are, which represent areas that were affected by depression when they did not light up. This picture was taken from the website linked above. 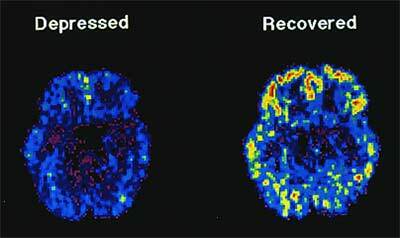 Here you can see on the PET-scan that the areas affected by depression are on the outskirts of the brain, following the serotonin pathways. The above picture was taken from the link marked under “serotonin pathways” above. Dopamine is also included on this particular picture. The picture is excellent because it explains what functions dopamine and serotonin have and what they are responsible for. Note that neither indicates any connection to anxiety. In fact, in terms of anatomy, the areas responsible for anxiety are not even highlighted on any of these two pictures! The questions necessarily arise: where are the anxiety sensitivity regions on the map? And if they are not connected to the depression part of the brain, why are anti-depression medications prescribed for anxiety? The picture above has 2 parts. On the left it shows of the many colors of various brain parts. One tiny green dot called the Locus Coeruleus is responsible for anxiety, which is an extension of the limbic system of the brain (often referred to incorrectly as the reptilian brain). Note that this particular part of the brain is separate from those that are affected by depression. On the right there is an important table. It shows the path that anxiety takes as it manifests itself. 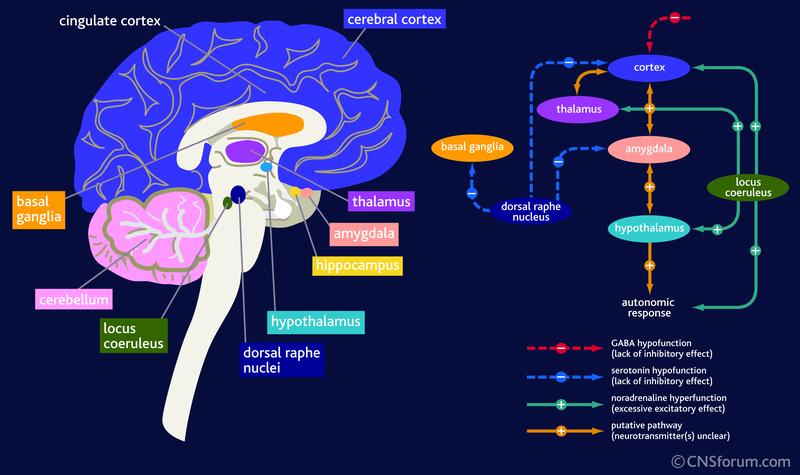 It starts in the Locus Coeruleus and then heads into the cortex (blue), the thalamus (purple), to the hypothalamus (light blue) and through the cortex also to the amygdala from which it passes to the hypothalamus and then to response. It also goes to a a couple of other places drawn in blue, one of which has a return arrow to the amygdala, considered to be the most important region of anxiety manifestation. The first thing to note it that there is some connection to the serotonin pathway but also note that the connection is one directional in all except on small 3rd removed from the dorsal raphne nucleus! Meaning stimulus of anxiety will enter into the serotonergic pathway but serotonin will not enter the anxiety pathways much at all it is so removed! 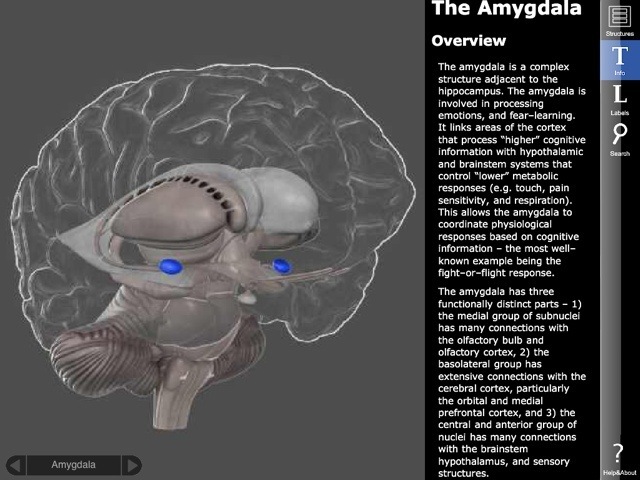 On this picture above you can also read some of the descriptions about the importance of the amygdala in anxiety–marked with the two blue areas. These pictures and analysis show that there really is no connection of significance between depression and anxiety. Most people I know who have anxiety (including me) are very happy people. There is no reason to give anti depression drugs when neither are they depressed not are they having problems with the part of the brain that needs serotonin. Why do doctors prescribe serotonin? The pharmaceuticals push the drugs. Now the FDA even approved psychotropic medications with serotonin for children as young as 8 years old, whose brains are not even developed. The damage these drugs will cause in the brains of children is unimaginable! We are creating a whole new generation of brain-damaged people! I noted at the beginning that sometimes serotonin does work for pains, such as migraine, where depression is not present but anxiety is. How is that possible? If you read my book–noted above–you will see that the cause of migraine is the lack of voltage in certain parts of the brain. It just so happens that in a large number of cases that brain region is associated with neurons that cannot function and those are neurons that normally manufacture serotonin. If then we provide serotonin to the brain, the pain will go away since the brain now sees serotonin and it cares little about an area that is not working. Serotonin did not cure the migraine; only it temporarily filled in the gap for those neurons that would normally make serotonin and now they cannot. Other times when the serotonin drugs don’t work, it is because the areas affected by the migraine are not located in the anatomical area where serotonin is normally made and so adding extra serotonin is not helpful. Thus the pain remains. In conclusion: giving serotonin and SSRI drugs to a whole variety of unrelated illnesses (migraine, fibromyalgia, bipolar, anxiety, dementia, ADD, ADHD, etc.,) obviously could not be useful for treatment. Most often these drugs are prescribed off-label, which I have already complained about since that is experimenting with humans without consent. Many doctors tell me that they do not like to prescribe anti anxiety drugs, benzodiazepines, because they are addictive and affect memory. But they forget (or shamefully perhaps don’t know) that serotonin drugs cause even more dependence, some cannot ever be stopped, and that they cause serious brain fog and memory problems and sometimes death by serotonin syndrome (toxicity). I wanted to spend a moment on explaining something about Benzodiazepines that confuses most doctors–especially “atypical benzodiazepine receptor ligands.” I have been told by several psychiatrists that ligands like Ambien or Lunesta or others are not benzos and therefore they are acceptable to prescribe when they disagree with the prescription of benzodiazepines otherwise. In this section I would like to provide an explanation about what “atypical benzodiazepine receptor ligands” are and how they work because they are listed under benzodiazepines for a good reason! The term “atypical” is probably clear; “receptor ligand” is the part that confuses many doctors because these refer to a chemical behavior that combined with the word “atypical” may suggest that these drugs are not benzos. Indeed they are not in terms of molecular structure but does that mean anything relevant? Atypical benzodiazepine ligands are listed under benzos! So how does that happen if they don’t work like benzos? So let me translate a bit so you understand what these two sentences actually mean and why they are important. In the nervous system, the neurons work by using their receptors to take in various neurotransmitters. Some of these receptors only handle one particular compound (like Oxytocin) while others, such as serotonin accept just about any molecule that is snug enough, even if not a perfect fit. When a receptor accepts a molecule of any kind, given that it is a receptor for serotonin for example, even it is has accepted a sand molecule, it activates serotonin release or blocking because the sand attached to a serotonin receptor. In other words what matters is where it connects and not what connects. This is important because of what ligands are. Ligands are imitators and impersonators of the molecular world. Use a ligand to sleep instead of a benzo and you sleep just as well. The receptors have connected to different molecules, one to a Valium for example and in the other instance to an Ambien, but the outcome is the same: the benzodiazepne receptor was activated by the ligand and hence the brain works as if it received benzo. Doctors who believe that atypical benzodiazepine receptor ligands don’t act like benzos are mislead by the definition that simply describes their molecular structure and not what they do. They act as benzos and thus they behave and become benzos. Do you still believe Benzodiazepines are worse than Serotonin drugs? What is the reason for the exchange from good benzodiazepine to bad serotonin or SSRI drugs? Is it that the pharmaceuticals pay more perhaps if you prescribe those? Or are doctors not educated right? I believe that SSRIs do more damage than good. I have yet to meet a single person for whom it worked and I know thousands who take it, or used to take it. I know hundreds who are trying to quit it and are having a really difficult time. I know many who ended up with serotonin syndrome (toxic levels of serotonin) and one I knew even died. I find it amazing how clueless our medical doctors can be and still prescribe serotonin in any shape or form! It is time we all stood up and told them that we know better! We must take our health into our hands! If we want to live to a ripe old age and have a great retirement, we better tell our doctors to stop and listen because we know the truth! No more serotonin in any form please unless it is truly indicated in “clinical depression.” In no other condition can serotonin in any shape or form be prescribed for us! And I have yet to meet a person who has the real clinical depression because chances are they are not out doing their shopping or chatting on the internet. I believe that a very large percent of the people receiving serotonin today have no clinical depression if they have depression at all! This entry was posted in Interesting reading, Migraine-Blog, Must Read, This & That, Thoughts and tagged adrenalline, anxiety, atypical benzodiazepine receptor ligand, bad drug, benzo, benzodiazepine, big pharma, clueless doctor, depression, drugs, noradrenaline, pharma, pharmaceuticals, serotonin, valium. Bookmark the permalink. 9 Responses to Antidepressants for Anxiety? Why? After trying a whole whack of antidepressants my doctor prescribed ativan as needed. 16 years later, I never upped my dose, my anxiety and sleep was under control and I had zero side effects. I took on average 1mg/day at most 1.5. Never the 3 prescribed because I didn’t need them and I’m not a fan of pills. My doctor retired and I was forced to withdraw. I am now very unwell. The doctors, every single one of them, look at me like it’s my own fault because I refuse to take antidepressants. To be honest, the antidepressants that I have tried over the years made me feel quite similar to how I’m feeling now with withdrawal. They won’t hear me. They are aggressive to say the least about my need for anti depressants. I feel so terrible right now, I am on the verge of giving in because I need relief. As I sat by my campfire last night, trying to collect my zen and ease my tension headache, I asked myself “How is this ok?”. My life was beautiful a month ago. I feel bullied and ridiculed for not accepting this medication. The pressure to take anti depressants is real. I am very sorry to hear what you are going through. Unfortunately your case is not unique–I see this happening all the time. Is there any chance for you to switch doctors? Antidepressants do nothing for anxiety but they either are ignorant about that or get paid for prescribing antidepressants. I think that in most cases it is more ignorance than money hunger but the outcome is the same. In my continuing of research and education (now certified for LCHF/keto), I am finding that there are food elements that ignite anxiety and more often than not, there is also a particular genotype that requires certain vitamins that can make a huge difference. I am not pushing any supplements here just would like you to consider asking for some blood work–or get it yourself at places like http://www.requestatest.com where you can order any blood test you want and evaluate your results (they give you a healthy range). You can then either seek a doctor’s advice or just decide for yourself–it is just a vitamin. 1) Let me talk about the genetic connection first since that is the most important–regardless what food you eat. Many people have a genetic variant in their MTHFR genes that prevent them from methylating their B vitamins properly–this represents something like 40-45% of the population so worthy of your test. B vitamins have a variety of roles in our bodies and B12, in particular, is extremely important to the brain and the happy function of the CNS. When I had my first anxiety episode (at age 19) in the form of a panic attack, my B12 was almost zero… I needed IV B12 for 3 months, weekly if I remember correctly. My anxiety tapered to tolerable levels after that but in my case, this was a precursor to migraines to come so my life took a different turn. I am still taking methylated bioavailable B12. In your case, it would be important to check your B12 levels in blood and also in urine. In blood they measure the actual B12 amount–lab ranges vary around between 200-1000 and about 700-800 is normal. The urine test is called: urine methylmalonic acid with reference range <0.4. If you have more, that means you are not absorbing B12 from your food. If you find you need B12, you should pick a methylated bioavailable sublingual kind of "Methylcobalamin". I use Solgar brand–it has the least gagging sweet taste and is a tiny pill. I am not affiliated with Solgar and am not pushing the brand in any shape of form. but I take that one. Important: if you are taking B12 now, stop it for 2 weeks prior to blood test; its half-life in the body is 10 days!! The test will then show if you need B12 or not. 2) The more complicated approach is to drop all anxiety initiating foods from your diet: these are carbohydrates. The most irritating of course is sugar but foods high in natural sugars are equally irritating: most fruits, starchy veggies, grains, and all processed foods. As a person of anxiety all my life, I now am no longer able to initiate an anxiety attack since I have quit all of the above for over 3 years. The difference this made is HUGE! It completely rewired my brain and body. I recommend you give this a try for at least 3 months without cheating. But how do you explain all these people that do take anti depressants feel better than before? Wether for anxiety or depression or even both? Alot of my friends swear by it. Surely that can’t be all wrong? Not at all offended! You asked a super question; thank you. Antidepressants work for “clinical depression” (meaning no known cause) for X% of the people X% of the time. This is not a lot of people: “Estimated response rates were 58.4% for antidepressants compared with 39.9% for placebo.” So there is also a placebo effect. This article may also be helpful. In this just read the “main result” that shows NNT (Number Needed to Treat) meaning that for each 1 person to be treated effectively, between 7-16 people were treated without success (NNT between 7-16). So as you see between the NNT and the placebo effect, it really only works for very few people. If the NNT is 7 (better outcome), that means out of 8 people 1 received benefits and 7 didn’t, so that is a 12.5% success rate. On the worse end of NNT 16, means that out of 17 people 1 got well and 16 didn’t so that means 5.9% success rate. These numbers are pretty sad if you consider what the implications are–for the case of NNT 7, 87.5% of the people are taking something that either provides them placebo effect or makes them sick. In the case of NNT 16, 94.1% of the people taking antidepressants are either placebo or are getting hurt. Pretty terrifying if you consider. So a lot of your fiends who feel better may fall into one of the two groups: placebo or truly working but given the proportions of “not working” based on NNT, I would suspect that for a large percent of them it provides placebo benefits. There is nothing wrong with getting placebo benefits only one could replace the pill with water-pill and they would feel just as well. That’s what it means. But at the same time, they may be damaging their brains for life–this will not be known until they get older. SSRIs can cause a lot of neuronal damage and so synaptic pruning may occur–that is brain degeneration. Hope this helps understanding what is happening! Almost made me unable to perform my job duties. Now I walk at least four miles on my days off . Also pray and read the Bible. I totally agree with you every time my doctor puts me on an new antidepressant once I am get pass the 10 mg. mark and sometime before I get migraines and I don’t think it does anything for my anxiety and my depression is only when my pain levels are so high, my anxiety levels are high and I feel depressed or I think that’s it, but maybe not. As soon as the pain levels are down, I am a happy camper. But, what I am getting more considered about is my memory and being on Lyrica, which I think monkey’s with my memory as well. I am wondering if I can knock down my Tomapax down to 50 mg. again if I got on the proper anxiety drug. But, how to get the doctor to do this??? Running thru the street with my hair on fire would be easier! Common (1–10% of patients): blurred vision, diplopia, increased appetite and subsequent weight gain, euphoria, confusion, vivid dreams, changes in libido (increase or decrease), irritability, ataxia, attention changes, abnormal coordination, memory impairment, tremors, dysarthria, parasthesia, vertigo, dry mouth and constipation, vomiting and flatulence, erectile dysfunction, fatigue, peripheral edema, drunkenness, abnormal walking, asthenia, nasopharyngitis, increased creatine kinase level. Pregabalin may also cause withdrawal effects after long-term use if discontinued abruptly. When prescribed for seizures, quitting “cold turkey” can increase the strength of the seizures and possibly cause the seizures to reoccur. Withdrawal symptoms include difficulty sleeping, nausea, anxiety, diarrhoea, flu or flu-like symptoms, headache, increased sweating, convulsions, pain, dizziness, nervousness, and depression. Pregabalin should be reduced gradually when finishing treatment." So my explanation: Please note that the drug is radioactive and while 98% of it exits, it is in your body as a radioactive agent until it is gone out of your body and 2% remains in your body from each pill. Also note that the drug exists the body unchanged, meaning it is not a drug that actually absorbs like an NSAD to reduce inflammation. What this drug does is it plugs in a receptor such that it interferes with the neurotransmitters (those are the hormones in your brain) release. Note that Pregabalin (the generic name)is not discretely selecting for one kind of neuron but blocks partially the calcium channels for all neurotransmitters, so it affects all aspects of the working of your brain. Another important factor is the half life. Most doctors believe that the faster the drug is out of your system, the better it is. This is certainly true for non-psychotropic drugs like a pain killer Ibuprofen because one does want the metabolic life to be short to not hurt the kidney or liver, whatever drugs you take–Ibuprofen would hurt the kidney. But in the case of Lyrica, the drug is a psychotropic to which the brain gets addicted meaning it becomes dependent on its continued use. You cannot just not take your Lyrica one day and not expect an adverse reaction. For most people it takes several months to get off these drugs even if they only used a very small dose and for a very short time because the brain is a very adaptive mechanism. Once it is getting a drug to block something, it either stops doing it itself (in the case of dopamine for example) or makes a ton out of control (like in the case of SSRIs). Thus stopping one is very hard. I also wanted to explain a bit about the role of the calcium channels in the brain so that you know why it is a very dangerous drug to take. Brain cells have a variety of ways in which they eat drink and be marry, and do their jobs. They have 2 jobs in particular. 1) decide if an electric signal received from a neuron next door needs to be amplified or not and 2) send the corresponding neurotransmitters if it needs to be amplified. The calcium channel Lyrica blocks partially on all neuron are the ones responsible for kicking out the neurotransmitters so your neurons are able to make it only cannot get rid of it so it build up in the neurons. Because it builds up and the cells cannot get rid of it, they will stop making it! This is where the danger will come in because if the medication was selective to some specific neuron that manufactures some specific neurotransmitter that causes trouble, that would be fine. But this reduces the manufacturing of all neurotransmitters across the board in your brain. That means that in theory it can affect every single element of your body functions. This is why if you read the “common” symptoms, they range from tip to toe. I highly recommend you print this out and take it with you to your doctor appointment and ask your doctor to read it while you are there! Few doctors need to know the drug to the detail I just gave you and so he/she may not be aware of what it does and how and does not know the full blown consequences of these drugs. I also think that doctors today completely misunderstand what benzodiazepines do (perhaps they are taught that way in school, I don’t know) but a Valium, for example, which has a very long half life in the body, causes a complete anxiety relief all through without any ups and downs since it is in your system with its half life more than a day for people your age. Doctors say they don;t like to prescribe it because it affects memory… and then then prescribe Lyrica that affects memory and every single other function your brain does, including your body’s metabolism, which Valium does not do. Valium is a bad name is psychiatry but then I have yet to find a doctor/psychiatrist who actually understands that modern drugs do more damage than the old. Unfortunately the pharmaceuticals all feed the modern drugs because they have patent rights for most of them whereas you can get any benzodiazepine type as generic. This makes the pharmaceuticals unhappy since they need not be the ones selling the generic! This is the real reason why modern drugs are pushed.